Internationally known artist Frank Boyden has exhibited his work in museums and galleries throughout the United States, Canada, and Europe. In this new show, he has selected favorite pieces from his studio, exhibiting rarely-seen ceramics from across his career. Also included in the exhibit are new collaborative works with ceramist Tom Coleman, in a collection that combines technical mastery with the dark humor of Boyden’s subversive, skeletal line drawings. Boyden’s work retains an organic and dimensional quality, the vessels’ innate color and texture revealed by the intense heat of the kiln. Boyden works the materials to his own advantage, accepting only a select few for their exceptional and arcane presence. A native Oregonian, Frank Boyden graduated from Yale in painting in 1968. He taught at the University of New Mexico in the late 60s where he became interested In ceramics. He returned to the Oregon coast to live and founded the Sitka Center for Art and Ecology: a school for environmental studies. Boyden’s work is in collections including the Smithsonian Institution, Washington, D.C.; the Pushkin Museum in Moscow; the Portland Art Museum; the Tacoma Art Museum; and Oregon Health Sciences University in Portland. Major sculpture commissions include; the Hult Performing Arts Center, Eugene; the Oregon Coast Aquarium, Newport; Doernbecher Children's Hospital, Portland; and Tri-Met Transit Authority, Portland. Tom Coleman graduated from the Pacific Northwest College of Art in 1968 and currently owns the Coleman Clay Studio and Gallery in Las Vegas, NV. 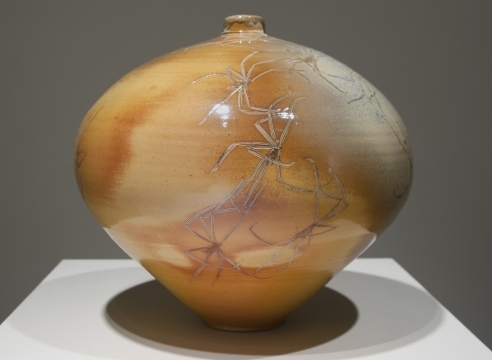 His work has been included in collections in the American Museum of Ceramic Art in Pomona, CA; the Grimmerhus Ceramics Museum in Denmark, the Hallie Ford Museum of Art; the Museum of Contemporary Craft; the Portland Art Museum and the Sapporo Sister City Collection in Japan.